Going off the rails in the engine room. Image courtesy of the Weinstein Company. One of my biggest issues with many recent films is the need for a very specific moral to be driven home to the audience that is oftentimes so blatant that I'm being bludgeoned by ideals. (I'm looking at you, Iron Man 3). But sometimes, a film comes along with an intriguing premise, leaves it on the table, and walks away, allowing the viewer to draw their own conclusions about the so-called "moral" of the story. This is exactly what Snowpiercer does. It is stimulating on almost every level - viscerally, visually, and mentally - but it hit some rough track on its run to the US. It premiered in South Korea on August 1, 2013, and due to a bitter dispute over the final edit of the film between South Korean director Joon-ho Bong and The Weinstein Company, it did not open in the US until June 25 of this year, and to an extremely limited release at that. It opened to a wider audience on July 11 as more theatres got on board, and it also became available for viewing via the Internet. 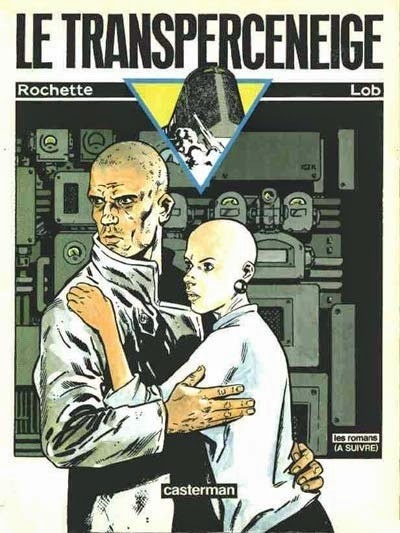 Original cover of 1982 comic. The year is 2031, and 17 years ago a failed attempt to solve global warming has left Earth a frozen wasteland. 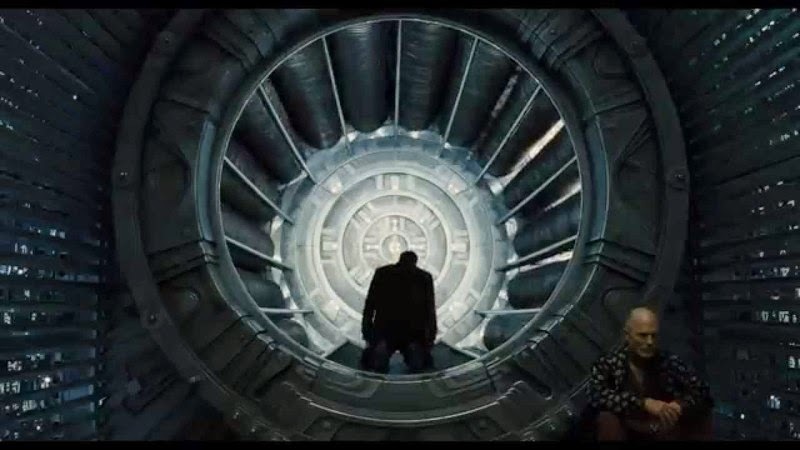 All that's left of humanity are the passengers aboard Snowpiercer, a massive train that continually circumnavigates the world thanks to an eternal engine created by a man named Wilford, played by an unctuous Ed Harris. Based on the French comic book Le Transperceneige, written by Jacques Lob and illustrated by Jean-Marc Rochette in 1982, the original concept of the train was that it was 1,001 cars long, whereas in the film (they never mention a specific number) it is probably around 200 with 1,000 passengers. Chris Evans, best known as the face of Captain America in Marvel's Avengers films, is almost unrecognizable as Curtis, the grubby leader of the "Tail Section", the part of humanity that has been treated the most poorly, subsisting only on blood-colored gelatinous bricks called "protein bars" of sketchy origins and being forced to survive in windowless, cramped corridors. I was immediately hooked on the premise, as trains are my most-preferred method of transportation. There's a strict order to their operation, they are quick, efficient, and have an intriguing history. Most of all, there's a loss of control once you are on a train that is all at once comforting and uncomfortable. In many trains, the further towards the front one goes, the better life gets, and Snowpiercer is no exception. Curtis, along with his comrades, (featuring appearances by Jamie Bell, John Hurt, Octavia Spencer and Korean actor Kang-ho Song) decide enough is enough. In just over two hours, the hunt to the front is on. This is the point where a lesser film would've descended into madcap violence and mayhem, with the final outcome blatantly clear. Not so with Snowpiercer. The further ahead the "tails" get to the front, the murkier and darker the plot becomes, to the point where I began to grip the arm of the chair every time the party managed to get another carriage door to open.Tilda Swinton, a personal favorite of mine, plays the truly despicable Mason, Wilford's evangelistic right-hand woman whose watery eyes peer out onto the downtrodden masses through frames that should've been thrown out with the shag carpeting of the 1970s. Most of the action takes place within the train, although we get glimpses of the frosty outside world. This makes for tense, telescopic cinematography, with plenty of long corridor views and choppy action sequences shot from every angle. It succeeds in trapping the viewer, and I was disturbed most of all by the things left unseen and unsaid. It took a long time for Snowpiercer to arrive at the station, but it has been well worth the wait. I'll be looking forward to owning my copy on Oct. 21! Brilliant, haunting, and unpretentious, Snowpiercer is a thriller that will leave me food for thought for weeks to come.View the international trailer below!